We are finally having HOT sunny days here in Seattle. Thank goodness for the tomato plants who have been very patiently waiting for the sun during the past three weeks. Seattle can be a unkind to tomatoes. Typically my plants are late bloomers and by the time their skins should turn red a blanket of clouds cover the sun once again leaving them an orange hue rather than red and a good supply of green ones too. I have learned it is best to plant “little” tomatoes such as cherry, grape, sun gold and/or a medium size roma varietal for our short lived tomato growing season. However, it could just be me and my lack of tomato growing knowledge. I have a pasta recipe here which requires only one burner on your stove for boiling the orecchiette. A summery fresh pasta while keeping the heat out of the kitchen! Bring a large pot of salted water to a boil. Add the pasta, and cook until it is al dente. While the pasta cooks prepare the pesto. Place cilantro in food processor and whizz until finely chopped. Add the remaining ingredients and whizz until it is a well mixed pesto. Slice sugar plum grape tomatoes into small bits and set aside. Drain the cooked pasta without shaking the colander too much leaving a trace amount of the cooking water. Return to the pot and stir in the pesto. Taste to see if you need to salt. 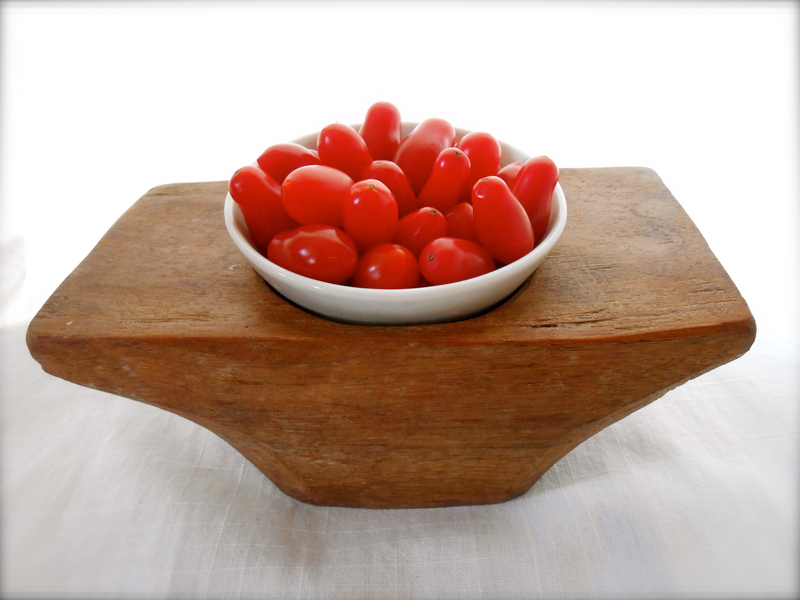 Place in serving bowls topped with sliced sugar plum tomatoes and a sprinkling of freshly grated Parmesan. 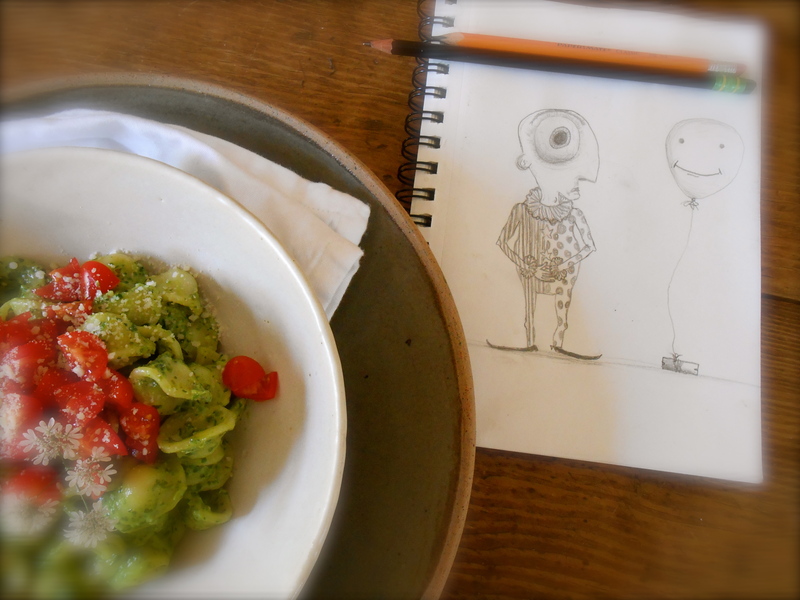 Yes..he loves to draw ;) and I agree…this heat is a great excuse to make pesto…every other day! I have the same problem for different reasons where I live in Oklahoma. It gets so hot here in the summer that tomatoes will just crack and burst. So for years now I’ve only been growing Romas and cherry/grape varieties. But I really prefer those anyway!!! I love love your pesto and pasta. Great great photos! Very nice idea to make pesto with cilantro, I have never done that. Abrazo! That dish looks delish’. I am no tomato expert but just two hours north from where you are we have the same tomato issues.. :) I gave up growing anything bigger than a Roma as well. Lucky for us that there are so many beautiful varieties of the little one now. I got to plant black ones and pink ones this year. Oooo. Black and pink tomatoes, sounds fun! Last year I my favorite was a speckled pink one. I just love all the heirlooms available. I have grown to love the little tomatoes. Maybe we are experts for our area?? :) hmmm…two hours north…gorgeous country up there! This is beautiful and I love cilantro pesto! It seems that your summer is ahead of ours. It’s been unseasonably wet and cool and the tomato plant are well behind schedule. But on the plus side – everything is SO wonderfully green. Prior to Saturday we were unseasonably wet and cold too! We’ve have 3 days of HIGH HEAT! (88°F..not too high..really) :) It’s suppose to get back down into the 70’s tomorrow. Poor tomatoes…. Dish looks great , but my eyes were drawn to the board on which you placed the little tomatoes. It’s gorgeous! I’ve never seen anything like it. Can you tell me more about it? Thank you…and thank you for stopping by my blog as well. :) Your’s look like it is off to a great start. 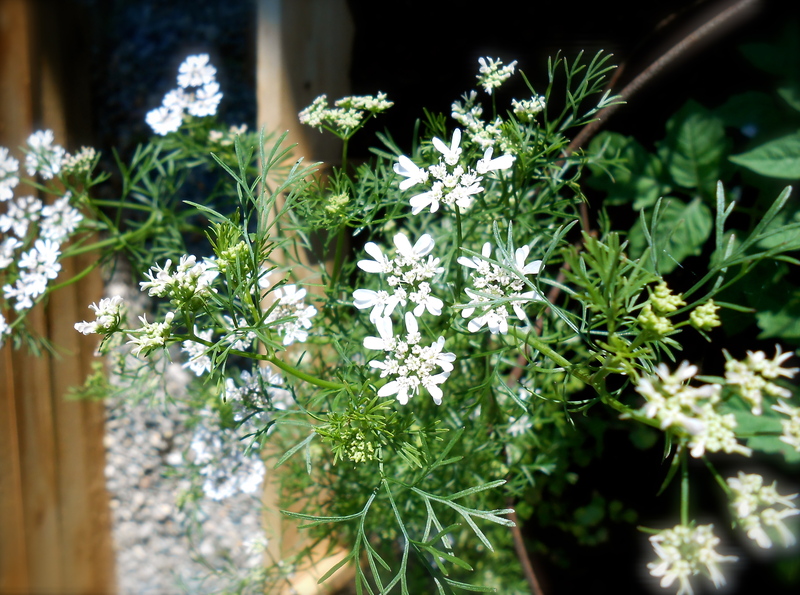 As I seem to be on a theme of coriander/cilantro I’ll definitely be making your pesto. Before that in the queue is parsley pesto and walnuts. Hmm, don’t think I can get pecans here so I’ll probably have to sub. Love the sound of your orecchietta with pesto recipe. A delicious combination of ingredients. Oh, that looks utterly delicious! Hubby would love this… he is a big fan of cilantro! And I just LOVE orecchiette!! Beautiful! Thanks! You need to make this. It’s fantastic and I have been using this same type of pesto for all kinds of dishes since…delicious. i’ve try many pesto, spinach, kale, mint but none with flat leaf parsley or cilantro…..
never seen orecchiette before, looks so cute shaped pasta! :) The orecchiette is shaped like little helmets! Give the cilantro a try…you will be pleasantly surprised how delicious. Laura… I think you are right orecchiettte is little ears. My son calls them “hard hats”. I appreciate your comments and checking in! the tomatoes are gorgeous! i’ve never tried other pesto than basil. You are currently reading orecchiette pasta with cilantro pesto at COTTAGE GROVE HOUSE.